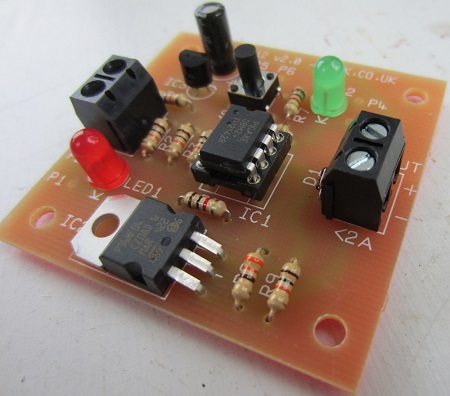 Buy of MINI 12V PROGRAMMABLE LOW VOLTAGE DISCONNECT LVD. This device is designed to protect a 12V battery or battery bank from being run down excessively and suffering permanent damage. The output from this low voltage disconnect is rated to 2 Amps. This can be used to directly power lighting and other devices up to a total of 2 Amps, or can be used to energise a relay which in turn can switch much higher current levels. When the output is on and the measured voltage dips below the user set low disconnect voltage, the red LED will turn on. If the measured voltage remains below the disconnect voltage for 10 seconds continuously then the output will be turned off and the red LED will turn off. Subsequently, when the measured voltage exceeds the cancellation voltage (after the battery has been charged up a bit), the green LED will turn on. If the measured voltage remains above the cancellation voltage for 10 seconds continuously then the output will be turned on again and the green LED will turn off. 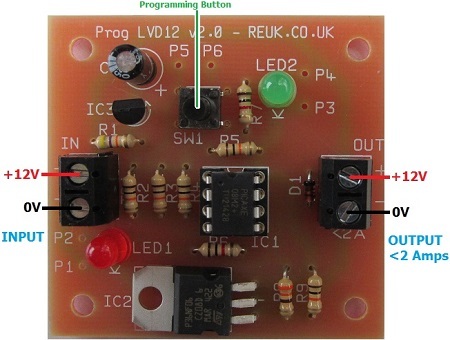 This device is a miniaturised and more affordable version of our premium 12V Programmable Low Voltage Disconnect, and the instructions for the user to set the disconnect and cancellation voltages given there should be used for this device. The size of this board is just 50 x 50 x 20mm. Click here is you need a 24V programmable low voltage disconnect. Note that the red and green LEDs will only come on during transitions of state, and these take place occur rapidly. The vast majority of the time the low voltage disconnect is drawing around 1mA @ 12V = 0.012 Watts.